He will contest the $10,000-to-win Mayor's Cup sponsored by BK Trading Australia Pty Ltd. The event also doubles as round five of the season long Ultimate Sprintcar Championship � a series Farr has dominated in recent years with tournament title victories in Queensland, NSW and South Australia. It's also a very big occasion for Toowoomba's own Andrew Scheuerle who last weekend took out the time honoured Australian Sprintcar Championship at Brisbane's Archerfield Speedway. In winning, he became only the second Queensland driver to take out the national title since its inception in 1963! This weekend's big money race at Toowoomba also means a lot to Farr as it will be his first appearance at the track since his emotional victory in the prestigious Grand Annual Sprintcar Classic at Warrnambool's Premier Speedway last month. This was one event that Farr had chased relentlessly for years and had always pulled up short or was denied victory when bad luck struck at a time a win seemed on the cards. For Scheuerle, too, it was a special moment in his long career after his national title success. He has entered this race for many years. � We won two out of three qualifying races and every time we hit the track we went forward, however you never know what's going to happen in a race like that. I just wanted to keep my composure and just treated it as another race,� Scheuerle said following his Australian Championship win. The only other originally residing Queenslander who has won the Australian Sprintcar Championship is Todd Wanless who took honours in 1996 also at Archerfield. A very impressive Sprintcar entry list is anticipated from around the state and Toowoomba regions. The Ultimate Sprintcar Championship, run over a series of rounds, has developed into one of the most prominent series on the national Sprintcar scene in the years it has been in operation. 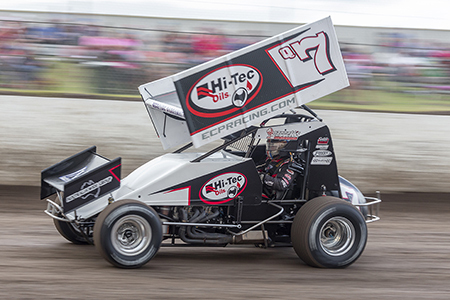 The USC brings together the big name competitors and fans at Hi-Tec Oils Toowoomba Speedway are very fortunate the stars of the sport always haul into the local circuit whenever a tournament round is held. But they all have to beat Scheuerle and Farr � the latter who drives for the professional East Coast Pipeline Racing Team. Farr's recent Warrnambool Grand Annual Sprintcar Classic win now sits nicely beside his other magnificent achievements, which include The Australian 410 and 360 Sprintcar Championships; World Series Sprintcars Championship, the Australian Speedcar Championship, the President's Cup, the Kings Challenge and the Krikke Boys WA Shootout. His versatility also is typified with his victory in the South Australian Late Model Sedan Championship. Farr joins a very exclusive club among drivers who have won both the Australian Sprintcar and Speedcar Championships. The variety programme this Saturday night at Hi-Tec Oils Toowoomba Speedway also will feature Modified Sedans and Speedcars, while a fireworks display will be a highlight of the night.